little cletus, laxjoe, prerecordedlive and 4 others like this. pnk$krtcryna$ty, blind dog, laxjoe and 6 others like this. little cletus, laxjoe, Duck70 and 6 others like this. Prospector, Can I Spliff it, AndersHolmvik and 1 other person like this. Stagger Lee, Wu and Killy Me Please like this. Can I Spliff it likes this. Duck70, RockHardEnis39 and TC like this. The paintings indicate that early humans had “some pretty heavy stuff” weighing on their minds, archaeologists said. CANTABRIA, SPAIN—An archaeological team from the University of Cambridge announced Wednesday the discovery of cave paintings in northern Spain that suggest prehistoric humans battled a variety of inner demons, nagging fears, and insecurities that plagued them as they struggled with life’s demands in the Paleolithic era. Reddy confirmed that other images in the cave include a downcast man apparently being mocked by potential mates for his inability to start a fire, a woman using a stone chopping implement to cut her own body, and a seated man seemingly resigned to his fate at the approach of a charging mastodon. Further chemical analysis will have to be conducted to determine if the ominous red handprints along the walls were symbolic works rendered in red ochre or simply the result of anguished early humans striking the stone surface until they started to bleed. According to Reddy, the paintings not only represent the ability of Late Stone Age humans to express their immediate emotional torment but perhaps also to construct larger, more elaborate narratives of their prolonged, agonizing downward spirals. Through paint-application analysis and radiocarbon dating methods, Reddy said his team was able to determine that individual artists sometimes depicted their unraveling over a series of months or even years. 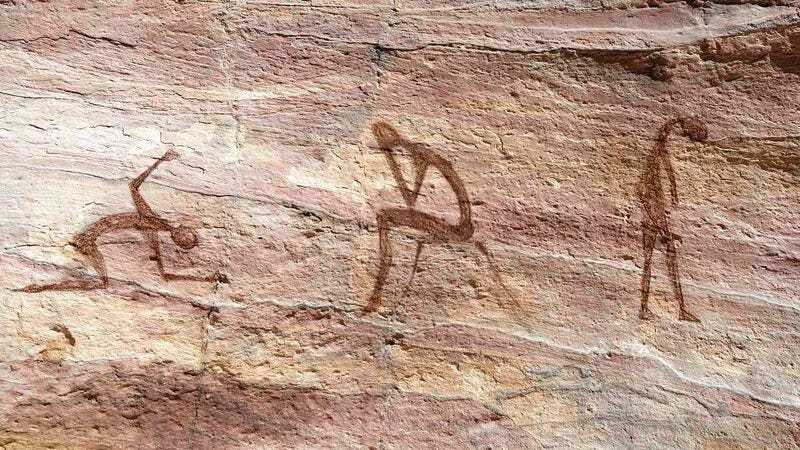 The discovery of the images comes just weeks after archaeologists uncovered a separate set of cave paintings in southern France, whose artists reportedly hunted, reared children, and otherwise did the best they could without taking themselves so goddamn seriously. Prospector, Duck70 and prerecordedlive like this. Hatfield and little cletus like this. Gregor, 941Gator, blind dog and 9 others like this. Hatfield, 941Gator and * J Y * like this. pnk$krtcryna$ty, duc15, shawnoc and 1 other person like this. Prospector, little cletus, devine and 5 others like this. blind dog, Prospector, CC and 2 others like this. AndersHolmvik, Can I Spliff it, Tobias and 10 others like this. Can I Spliff it, Popovio, laxjoe and 2 others like this. Fancy, laxjoe, duc15 and 3 others like this. Prospector, Popovio, Duck70 and 7 others like this. little cletus, Duck70 and Clown Baby like this. Can I Spliff it, Tobias, Duck70 and 5 others like this. AndersHolmvik, Tobias, Flagpole and 6 others like this. Prospector, blind dog and duc15 like this. Hatfield, IV, Tobias and 3 others like this. Hatfield, duc15, Tobias and 1 other person like this. laxjoe, duc15, little cletus and 5 others like this. laxjoe, little cletus, Clown Baby and 2 others like this. Prospector, Clown Baby and devine like this. Duck70, duc15, Fancy and 1 other person like this. pnk$krtcryna$ty, Wu, Tobias and 6 others like this. Tobias, AndersHolmvik, Clown Baby and 1 other person like this. Tobias, AndersHolmvik, little cletus and 1 other person like this. "I don't cry. I Saab." Kirk Fogg and Clown Baby like this. Tobias, Prospector, AndersHolmvik and 6 others like this. devine, little cletus, Tobias and 4 others like this. IanC, devine, Tobias and 5 others like this. fetumpsh and devine like this. pnk$krtcryna$ty and IanC like this. AndersHolmvik, Can I Spliff it, fetumpsh and 3 others like this. IanC and Clown Baby like this.